Though the temperature changes throughout the year, overall the Earth's temperatures are very stable. This is because we are surrounded by an atmosphere that lets just the right amount of sunlight in to warm the Earth. It then blankets the Earth to keep the warmth from bouncing back out into space. About 90% of the heat from the sun is absorbed by the greenhouse gasses in the atmosphere – water vapor, carbon dioxide, methane, nitrous oxide and oxygen. 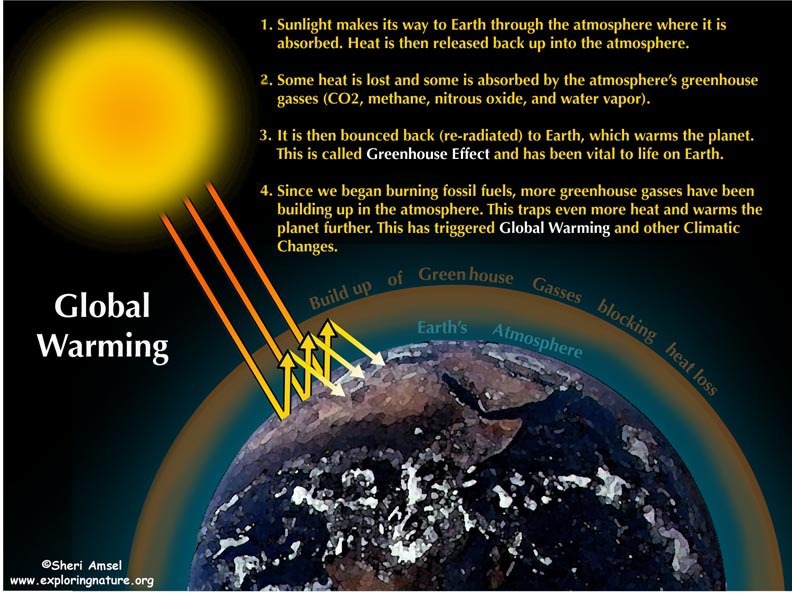 The greenhouse gases allow just enough solar energy in the form of visible light, and some infrared and ultraviolet radiation coming from the sun through the atmosphere to warm the Earth’s surface. Coming through the atmosphere transforms the solar energy into mostly infrared radiation, which has a longer wavelength. It hits the Earth’s surface and bounces back into the atmosphere. Some infrared radiation escapes into space, but some is trapped by the greenhouse gases in the troposphere – the layer of the atmosphere closest to Earth. This important process warms the troposphere and causes the greenhouse effect – without which Earth would be freezing rock. So radiating the heat back to Earth keeps the planet warm enough to support life – not too hot in the summer and not too cold in the winter. Scientists call this the greenhouse effect because the atmosphere acts a bit like a greenhouse by keeping the right temperature for life to thrive on the planet. Humans are now producing many greenhouse gasses of our own (like carbon dioxide, methane, nitrous oxide, and ozone) by burning fossil fuels in our cars, homes and industry. Scientists have begun to worry that too many greenhouse gasses are building up in our atmosphere. This could blanket the earth in an ever thicker atmosphere, blocking even more heat from escaping into space. Like a greenhouse with its windows shut on a hot, sunny day, it could make it get a lot hotter in here! This warming effect is called global warming. Carbon dioxide is created naturally through plant and animal respiration, forest fires and volcanic eruptions. It is also increasingly being made by humans. Since the beginning of the Industrial Revolution (in the late 1700s) and at an increasing rate in the last century, humans have been burning fossil fuels (coal and oil) which also release carbon dioxide (CO2) into the atmosphere. So do other human actions, like deforestation and desertification. This increase in greenhouse gasses has had some startling effects on the natural communities on Earth. Scientists are calling this Climate Change or Global Warming. Climate scientists estimate that carbon dioxide levels have increased by up to a third from human activities. Human activities also add to the increase in the other greenhouse gasses. Methane has increased from growing rice, decomposing garbage in landfills and domestic livestock (from both ruminant digestion and manure decomposition). Nitrous oxide has increased from the use of fertilizers and fossil fuel burning. Even water vapor affects the Earth's temperature. Water vapor in the atmosphere increases when the Earth warms creating more clouds and rain, which in turn increases the greenhouse effect too. The Global warming effect may warm the Earth by just a couple of degrees a decade, but over time this will add up. There is concern that this will melt the polar ice caps and raise the sea levels. Scientists at NASA can look at the Earth from space via satellites. They have noted that the year-round ice pack in the Arctic is indeed shrinking. In the past quarter century it has shrunk 10%. The largest ice shelf in the Arctic that had been in place for 3,000 years, broke up into the ocean in 2003. Climate does change naturally over time, but very sudden changes are unusual. These may be a sign of global warming. If the ice caps do melt, several things will happen. For one thing, the bright, white ice caps reflect a lot of the sun's energy back to space. As they disappear, more sunlight will be soaked up by the Earth. This will warm things up even more. Melting ice caps could change the ocean's saltiness (salinity) around the poles. This would affect the fish in the ocean. The melting ice caps would evaporate more easily adding more water to the water cycle. This could change weather patterns. New weather could change habitats around the world and all the animals that live in them. Polar bears are already struggling to survive when they need ice shelf off which they can hunt prey. Other effects of climate change could include: warmer oceans, more acidic ocean surfaces, rising oceans, rising global temperatures, shrinking glaciers, melting Arctic sea ice, melting Antarctic sheet ice and an increasing number of severe heat waves in the United States. Countries around the world are attempting to lower their carbon emissions to slow the build up of greenhouse gases and onset of global warming. Drive less. If you can walk or ride your bike somewhere instead of driving, it would be worth doing. Use public transportation when you can. Don't waste energy. A lot of electricity in this country comes from coal fired plants and they are big carbon emission producers. 1. How does our atmosphere protect the Earth and what do we call this “Effect”? 2. How are we creating greenhouse gases of our own? 3. What happens to the atmosphere to cause global warming? 4. Name three things that could happen to the Earth if our ice caps melt?